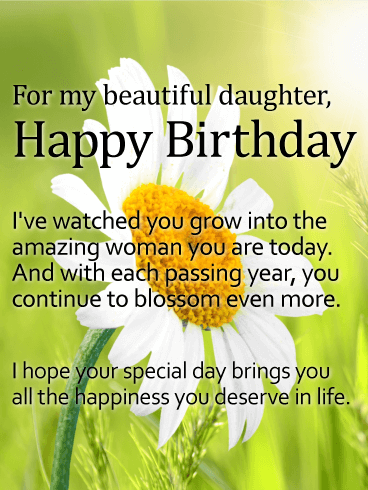 For my beautiful daughter, Happy Birthday - I've watched you grow into the amazing woman you are today. And with each passing year, you continue to blossom even more. I hope your special day brings you all the happiness you deserve in life. Is it your daughter's birthday? Do you want to celebrate it in the best way you can? 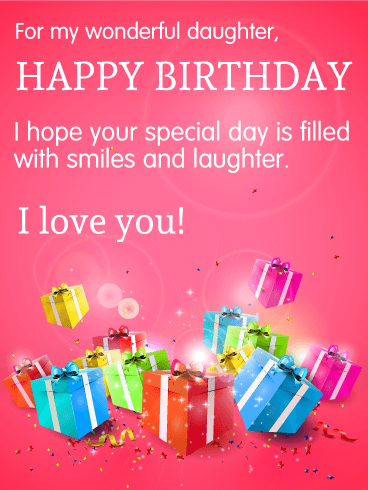 Then send her this fun Happy Birthday card! The brightly-colored balloons, pretty pinks, and sparkling glitter make this an exciting and awesome birthday card to receive! 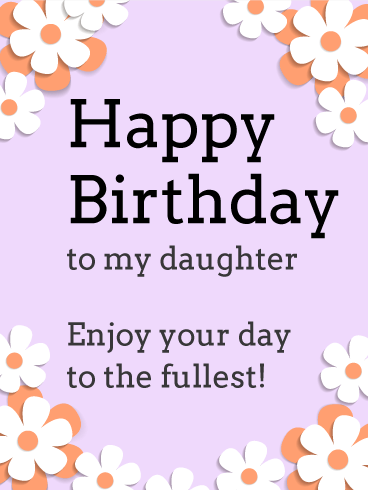 Add a sweet birthday message and send it to your daughter for a fun birthday surprise today! 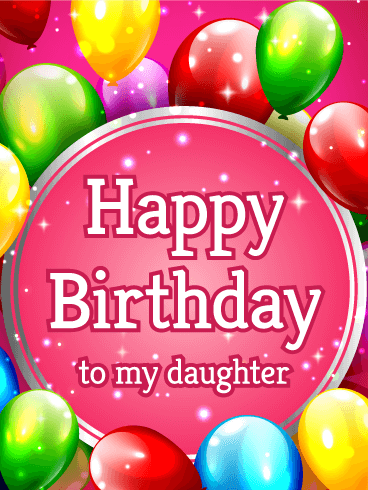 Your daughter's birthday marks the day that your entire life changed. On that day so many years ago, you held your daughter for the first time and knew that this little girl would change the world. 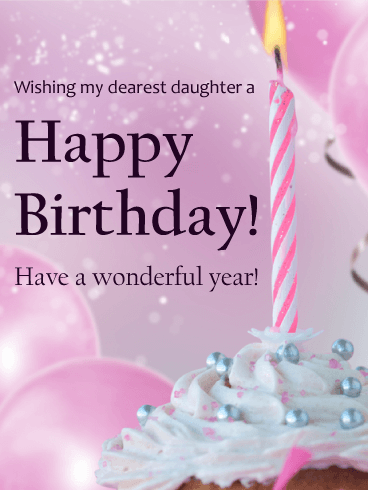 To celebrate another year spent with her, send this fun Happy Birthday card! The fun colors and design will show how excited you are for her special day and the celebration of her life! 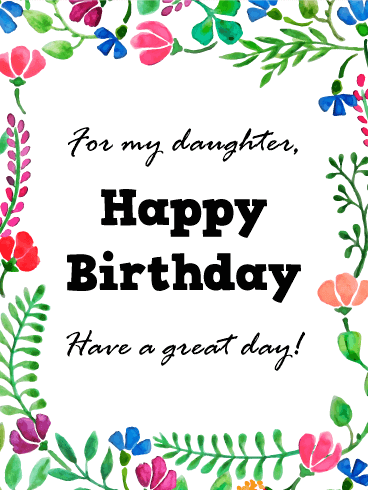 This feminine, delicate birthday card is the perfect way to wish your dear daughter a very happy birthday. Framed by sweet pink flowers, the heartfelt message conveys your special wishes while reminding her of how beautiful she is, both inside and out. This is a lovely choice to send when you can't be together, but you still want to let her know you're thinking of her on her special day. What a lovely birthday card to choose for your beloved daughter! She has always brought smiles and laughter to you, so why not wish her the same on her birthday. 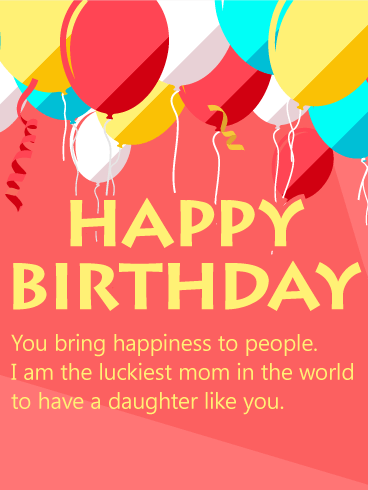 On this beautiful happy birthday wishes card, brightly wrapped presents with confetti and lights pop off the hot pink background. 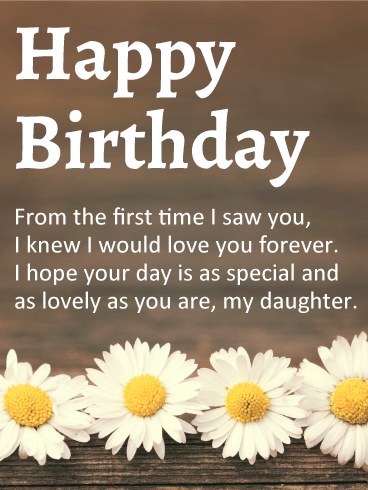 Your wonderful daughter will be so delighted to receive this happy birthday wishes card in celebration of her special day. Is your daughter as beautiful, strong, and diverse as a garden? Then use her birthday to tell her how lovely and amazing you think she is! 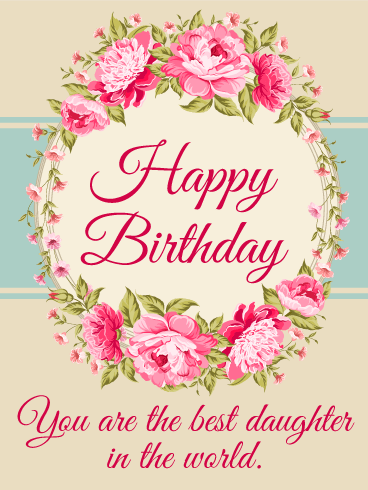 This Happy Birthday card is decorated with a variety of flowers, each one as gorgeous as your daughter. 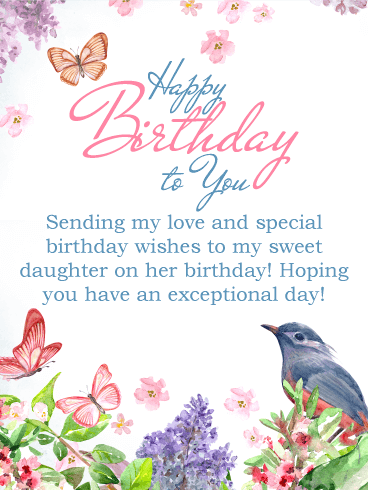 Use this birthday card to send your birthday wishes and help her have the most amazing birthday ever! So many years ago, you gave birth to the most beautiful, amazing daughter in the whole world. Now, on her birthday, you want to give her the best celebration you can! 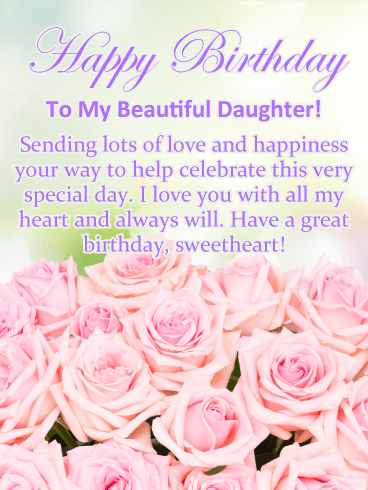 To make her special day amazing, send her this beautiful Happy Birthday card! The gorgeous pink flowers are just as beautiful as she is and the sweet message will show her how great you think she is! 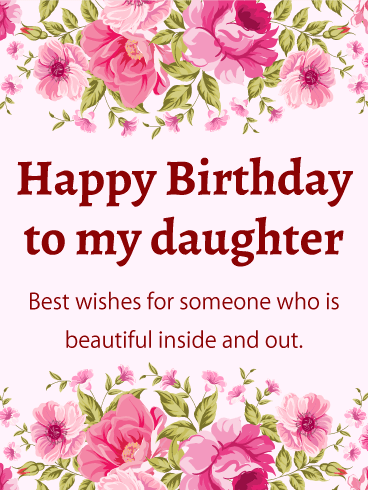 On her birthday, your daughter should feel all the love that surrounds her, especially from you. This charming birthday card does just that! Bright, blooming tulips create a lovely garden against a rustic wooden background, which is just as sweet as the message. What a wonderful way to wish a special daughter another year of all the amazing things she deserves. When she was a child, you had hoped she would be happy with the life she creates. And she certainly hasn't disappointed you! 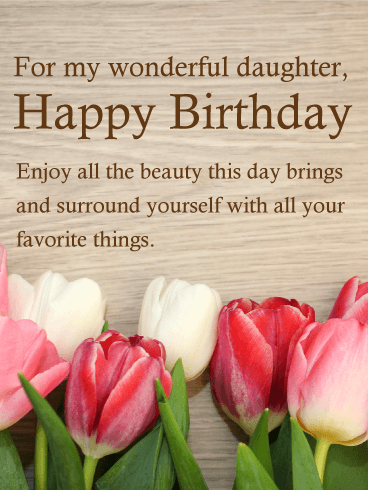 This lovely flower birthday card will help to remind her that even though her life is constantly moving, each day is a blessing... as she is yours. This birthday card is a warm reminder of the special relationship you share with your daughter, and that no matter how old she gets, she'll always be that baby you first held in your arms. A charming, rustic background featuring sweet daisies helps to express your best wishes, whether she's still a little girl or all grown up. Your daughter is still every bit the little princess she was growing up... she still loves sparkles and cupcakes and all-things pink! So she's sure to love this adorable birthday card, adorned with bright pink balloons, glitter, and of course a yummy frosted cupcake. What better way to tell the birthday girl how much you love her?